As autumn approaches, Chinese throughout the world take time to celebrate the Mid-Autumn Festival (中秋节). Also known as the Moon Cake Festival, this is a time for gathering with family and friends to celebrate the moon at its fullest. Traditionally, the houses and streets are decorated with red lanterns and moon cakes are served along a full feast to be enjoyed by the family. Having been celebrated for over 3000 years, this festival has collected numerous stories as to how it came about. 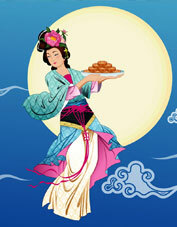 The festival is in honor of the love between Houyi and Chang’e. In most stories Houyi is a skilled hunter and archer. He has a student, Feng Meng, who is the antagonist in the story. Houyi is given a pill by a deity which would grant him immortality. He gives the pill to Chang’e for safe keeping. Feng Meng hears about the pill and waits for Houyi to leave. He then tries to take the pill from Chang’e, who takes the pill herself to keep it from Feng Meng. After taking the pill, her spirit flies to the moon where she is forced to live. When Houyi returns and hears the story, he desperately goes outside to their courtyard and, as he looks up to the sky, he sees shadow on the Moon in the shape of Chang’e. He tries to go to the Moon himself, but his efforts are futile. So he sets up a table where he offers Chang’e moon cakes, watermelon and much more, in the hopes that she, his goddess of the Moon, will return to him. Cultural tradition and legend are very important in Chinese culture, and still, thousands of years after the forlorn story of Chang’e and Houyi’s, moon cakes and watermelon continue to be served as the Mid-Autumn is celebrated. This year, the Mid-Autumn Festival falls on September 15th-17th, and in Chicago, we will have a full moon on September 16th! Come into Yu’s New Beijing Chinese Restaurant to celebrate the fullness of the moon and enjoy our delicious food with your family and friends. Our restaurant is open 7 days a week for dining in, pick up, or delivery. Visit our website or call us at 630-439-1535 to place your orders. This entry was posted in Chinese Festivals and Holidays and tagged 2016, 60137, Beijing Chinese Restaurant, Chinese calendar, Chinese culture, Chinese Festival, full moon, Glen Ellyn, Illinois, Mid-Autumn Festival, Mooncake Festival, Yu's Garden Chinese Restaurant. Bookmark the permalink.